1. Rubber extruding melt pump can better control the temperature of rubber process. Due to heat or other factors, the rubber material has been partially crosslinked before entering the vulcanization process, and the rubber macromolecules are transformed from linear structure to reticular structure, that is to be vulcanized ahead of time. As the vulcanization occurred before the normal vulcanization process, the conditions for vulcanization, such as temperature, pressure and time, did not meet the requirements of the process. Therefore, only partial crosslinking occurred in rubber molecules, and the properties of the vulcanization were the increase of viscosity and elasticity, and the decrease of plasticity. Therefore, in the process of rubber processing, the control of technological operation conditions, namely temperature, is very important. 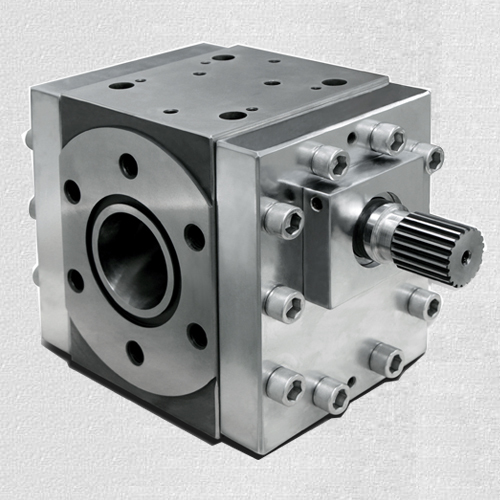 As the gear pump is added, the gear pump plays the role of increasing the pressure, and the pressure of the extruder can be reduced. Thus the melt reflux in the extruder and the corresponding shear force decrease, the increase of the melt temperature in the extruder is reduced, and the corresponding process temperature is more easily controlled. 2. Rubber extrusion melt pump to improve dimensional stability of rubber products. Generally, the rubber feeding amount is not balanced, the density of the raw material is sometimes changed, and the mechanism of the screw movement in the extruder is added, so the pressure of the rubber melt in the general head is usually pulsed wave, usually up to 5~30 bar (1bar=105pa). If the rubber gear pump is installed at the back of the head, the meshing degree of the teeth can be increased by continuous meshing between the teeth and the involute helical gear technology used by the MP-X rubber pump, so that the pressure fluctuation can be eliminated continuously and smoothly. For the subsequent process, it is important to ensure the smooth flow of the material and reduce the fluctuation of the melt pressure, as this ensures a more stable product size. The smaller the fluctuation of melt pressure, the more uniform the thickness of wire, cable, tube and sheet will be, and the size of the wire will be controlled more accurately. Product size stability not only can greatly improve the quality of products, reduce the defective rate of finished products, and more importantly, save material consumption. Because of the rubber products such as CaCO3, talcum powder, chemical additive and so on, the rubber extruder is especially easy to wear. After running for several years, there will be a lot of wear between the screw and the barrel inside the extruder, which leads to the increase of the gap. In this case, with the increase of head pressure in production, the amount of melt returned will also increase. As a result, the output of the old screw will decrease relative to the new screw. At this point, if a MP-X rubber extrusion melt pump is installed, this problem can be improved. Because the extruder does not have high pressure, it only needs to concentrate on feed and melt, the pump is used for lifting pressure, so the outlet pressure of the extruder can be reduced and the melt reflux in the extruder is reduced, so the output is increased.